GM Europes head of manufacturing, Eric Stevens, will return to North America to head the global manufacturing engineering operations of General Motors Co.
Stevens, 53, will replace Mary Barra, who will become vice president, global human resources, effective Oct. 1. Stevens has been GM Europes manufacturing chief since July 2004. He has been based at GM Europe's headquarters near Zurich, Switzerland. Stevens will replace Mary Barra at GM headquarters. He joined GM's Canadian headquarters staff in 1978 and progressed through a variety of assignments in materials management, quality and manufacturing. In 1991, Stevens became director of quality and reliability at Opels factory in in Zaragoza, Spain. Two years later, he was named president of Opels factory in Eisenach, Germany. In 1997, he became executive director for lean manufacturing, responsible for planning and implementing five new GM plants around the world at Gliwice, Poland; Gravatai, Brazil; Rayong, Thailand; Rosario, Argentina and Shanghai, China. Wolfgang Leimgruber has been named Porsche AG's head of the production and logistics. Leimgruber, 59, succeeds Michael Macht, who was promoted to Porsche CEO last month following the departure of Wendelin Wiedeking. Leimgrube has been with Porsche since 1978. 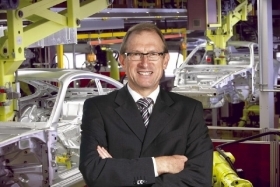 Leimgruber, who joined the company in 1978, is credited with helping Wiedeking successfully restructure Porsche's production processes when he was head of car body manufacturing and paint in the early 1990s. Since 2007, Leimgruber has served on the supervisory boards at Porsche AG and its parent, Porsche Automobil Holding SE. He left the Porsche SE's board earlier this year and resigned his post on the Porsche AG board to become the newest member of the sports car maker's executive management team. Leimgruber was born in Laupheim, southern Germany. He is a trained engineering machinist and has a degree in engineering from the Technical University of Stuttgart.